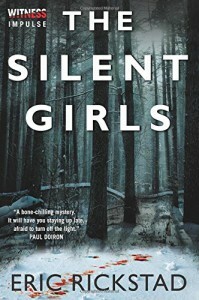 The Silent Girls is set in Vermont and Rath, a former police officer, now private investigator is helping the local police look into the disappearance of a young girl. Part way through the investigation other disappearances are revealed that look similar and then a body is found. Rath has been raising his niece alone since his sister and her husband were murdered when she was a baby. That murderer is now up for parole. Both situations are affecting him deeply, combined with chronic back pain and not being able to get in touch with his niece at her university he starts to panic. I did enjoy this novel. It was easy to read and the characters were believable. Rath wasn't the nicest person that you would ever meet in a novel but you could understood the reasons for why he handled things the way that he did. The different points of view were handled well, to reveal what these views were, would give away the main storyline and that I don't want to do. But it is a debate that is common everywhere. There were a few loose threads, but I have noticed that there is a follow up. Hopefully they will be resolved then. I did have one problem with this novel and that was with the amount of spelling errors and at one point a character's name changed. Just a little confusing. Thanks to the publisher for the published book received for review.